These are human beings that have been infected with the T-Virus and have become zombies as a result. These enemies can transmit the virus when they bite their victims. They can only be efficiently killed when their brains are destroyed or when burned to ashes. Repeated gun fire can also kill them, but if the brain is not destroyed there is a risk that the zombie could continue to evolve and mutate into a more dangerous creature. These zombified dogs were running free in the Raccoon forest, killing anything in their path. They apparently escaped from their kennels at the Spencer Mansion, where there is evidence that they were expose to experiments with the dreaded T-Virus. 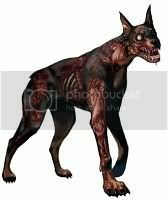 Since the virus increases the aggressiveness of the organisms that it infects, the dogs show this very characteristic. Their hunger for living flesh also has increased and they even practice cannibalism with each other when there is no food source around them. 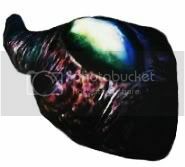 This new type of leech was created by Dr. James Marcus, when he combined the "Progenitor" virus with the DNA of ordinary leeches. He thus discovered a new virus that he named "T" or T-Virus. The mutated leeches carry this new virus and can propagate it to any living thing they come in contact with. They have learned to work as a group, attacking as a swarm. A special ability of theirs is to come together and imitate the human form of their former master, Dr. Marcus. In their humanoid form, they can become a tougher creature that is resistant to fire arms. These are wild crows that have come in contact with the T-Virus while eating the corpses of infected organisms. This insects have been exposed to the "T" virus and they exhibit high-energy growth and increased aggressiveness as a result. It appears that these creatures were created using praying mantis. This was done to take advantage of the insect's legendary voracious nature. Code-named "MA-120 HUNTER" by Umbrella, these fearsome creatures were created to hunt down adversaries that had become immune to the T-Virus by way of a vaccine. They were to complement other Bio-Organic Weapons designed mainly to propagate the virus. The Hunter was created by William Birkin, who used human DNA and combined it with some reptilia genetic material. This enemy is basically a giant tarantula spider. It has grown due to the T-virus and seems to be the type of test animals that were used by Umbrella in their experiments. One of their most common attacks, is to spit venom at their prey. These are mutant frogs that were injected with the T-Virus. As a result, they have more leaping power and suffered abnormal tongue growth and appetite. It's nature is to attack all moving objects. Mutated leeches that take the appearance of their former master, Dr. James Marcus. In that state, they are known as MARCUS LEECH and move and behave in a similar way that the doctor did in life. But when they feel threatened, then they transform into another variation of the humanoid form. 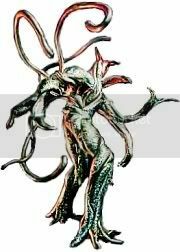 They become LEECH ZOMBIES and are extremely aggressive and resistant to conventional weapons. They do appear to be weak against fire, though. 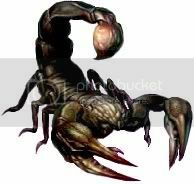 Like all insectae that is exposed to the T-Virus, this scorpion size has increased many times over. The idea behind the "Type-Y139", as Umbrella code-named it, was to create a weapon with hard armoring. However, the armor of the STINGER wasn't uniformly strong all over it's body. The armor on the head was weak and fragile. Thus it's usefulness as a B.O.W was considered very limited. Unlike the other oversize insects that Umbrella created, this one is actually a forest creature that was accidentally expose to the T-virus when the outbreak occurred. The Centurion is not a very dangerous foe. And it's unlikely that Umbrella would've used it as a weapon since it's attacks are not very effective and it has a weak armor coating. However, it is not entirely harmless. This enemy was one of the bats that inhabit the church near the laboratory. 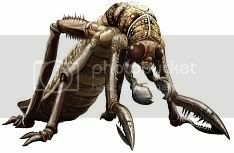 It is improbable that Umbrella would find any use for it, thus it is theorized that this creature was exposed to the T-virus when it ingested contaminated blood from an infected organism. William Birkin originally developed the Proto-Tyrant in order to create the ultimate Bio-Organic Weapon. However, he soon discovered that the Proto-Tyrant had limited capacity to think and move. It suffered from poor eye-sight and had trouble detecting it's prey. It was considered a very unstable creature and therefore, had little potential as a weapon. Birkin disposed of it in favor of the much advanced "Tyrant-002". This is the ultimate manifestation of the Mutant Leech swarm. The Queen Leech holds the identity and thought patterns of it's creator. And was able to make the leeches imitate him in order to communicate with the humans that encounter it. But when the leeches are attacked overwhelmingly, the Queen Leech manifests itself and becomes and awesome foe practically invulnerable to everything... except sun light. These primates are infected with the "Progenitor" virus. As a result, the virus incremented their fertility, mental capacity and aggressiveness. However, the virus made them nearly blind. They offset that disability with an improved hearing ability. The Eliminators were originally designed as melee attack weapons. They were later replaced with the much more powerful and agile Hunters. © Resident Evil 4 All Resident Evil from the perspective of a Nintendo gamer is an Anakenobi (a.k.a. Pikminister) production. This site is not an official Resident Evil/Biohazard website. It is a creation of a fan of Capcom's famous survival-horror franchise. This fansite is not related with or endorse by Capcom.